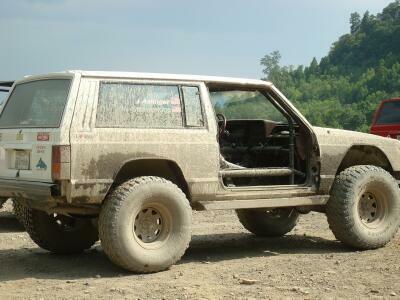 "Making Removable doors for a Jeep Cherokee XJ." Jeep Cherokee’s make great off roading vehicles. The combination of the coil spring front suspension and leaf spring rear makes for a stable but agile performance on the rocks. While the enclosed body of the XJ is nice for storing lots of gear and keeping the elements at bay, visibility suffers when in extreme situations. When trying to carefully place a tire on a rock or when trying to see where you are hung up, the doors are very much in the way. On my XJ I wanted to be able to lock up the cab for security and also to have the option of being enclosed when the weather gets cold. Therefore, rather than completely removing the doors I modified the door hinges to make them easy to reinstall. Disclaimer: Modifying the door hinges weakens the safety integrity of the door in a side impact. I suggest that this modification only be done on off road vehicles. Any modifications you do must be at your own risk and discretion. I began by removing the doors by loosening the six torx head bolts that hold each door to its hinge. I carefully marked the hinge location so I could put it back in it original location. Removing the torx head bolts is a bit tricky as there is not always enough room to get the bit square with the bolt head. I stripped on torx bit while removing my doors. I also resorted to cutting one bolt head off with a cut off wheel when it stripped out the splines of the bolt head. With the doors out of the way, I used a cut off wheel to cut the bottom fork of each door hinge. I used a hammer to tap it off the pivot pin. I then cut off the part of the pin that stuck through. Then I carefully tapped the top part of the hinge off leaving the hinge pin in place in the hinge. I then used a drill to ream the hole in the hinge mount slightly so that the pin would now slide in place instead of being a pres fit. I also cut the pin on the top hinge slightly shorter than the bottom to aid in reinstalling the door. Alternately you could use bolts to replace the pins and weld them in place. I may do this in the future as the hollow hinge pins may not hold up to repeated removals. The flange around the hinge mount on the door itself will interfere when trying to line up the pins when reinstalling the doors, so I cut part of it away for added clearance. Next I reinstalled the hinge halfs on the doors and tightened the bolts putting the hinges back on the marks made earlier. To reinstall the doors, simply place the lower hinge pin over the bottom hole and then line up the top pin and lower the door into place. My XJ is a two door so the doors are long and heavy. Sometimes it is helpful to have and assistant when reinstalling the door as it is awkward to hold. I have been very happy with this simple modification. The first thing I noticed was the extra responsiveness by having the weight of the doors gone. The second thing I noticed was the great visibility. I felt like I was driving a Wrangler. I could lean over and see where the tires were! Also by having the passenger door off, I could look through and see how close I was to obstacles on the opposite side of my Jeep. In my first outing, I got to deal with rain. However, most times the roof was all the shelter I needed. Only occasionally did the rain blow in from the sides. And back at camp I was able to reinstall the doors and lock up everything for the night. It did look funny to have a completely muddy Jeep with clean white doors!